Institute captain, Michael McCrudden is attracting interest from various clubs. 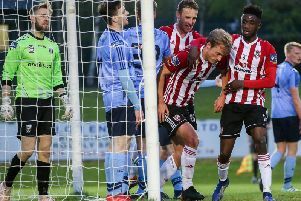 Derry City manager Declan Devine has reiterated his desire to bring Institute captain Michael McCrudden back to the Brandywell club. Devine insists McCrudden would be the perfect fit for his new-look Candy Stripes outfit and is hopeful the two clubs can reach an agreement in the coming days. Derry face stiff competition for the player’s signature - with League Two club Port Vale the latest to show an interest in McCrudden, who has netted an incredible 18 league goals so far this season for ’Stute. Glenavon and Ballymena United both remain interested while Coleraine have had an initial bid turned down by ’Stute. It’s understood the Bannsiders then tabled a much-improved offer with add-ons should the club qualify for Europe this season. Commenting after Coleraine’s 1-1 draw with Glenavon last weekend, Bannsiders boss Rodney McAree said he hoped for some clarity on the situation in the coming days. Despite the ongoing speculation, Institute boss Paddy McLaughlin remains hopeful McCrudden stays with the club but is hoping for as speedy resolution.